Processor Base Frequency: 3.2 gigahertz. Processor Turbo Frequency: 4.6 gigahertz. Graphics Max Dynamic Frequency: 1.2 gigahertz. With 3.2GHz processor speed which gives you efficient use of the processor, high processing throughput and improved performance. Intel Core i7-8700 - 3.2 GHz Hexa-Core Processor. Condition is Used. Boosts to 4.3ghz. No cooler just processor. And you'll experience maximum performance for everything you do. Clock Speed :3.2 GHz. Type :Core i7. Max Turbo Speed :4.6 GHz. Included Processor Accessories :Cooler (fansink). Product Type :Processor. 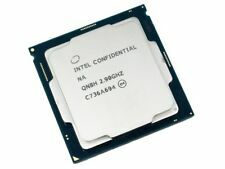 Intel Core i7-8700 - 3.2 GHz Hexa-Core (BX80684I78700) Processor. Condition is Used. I’ve used this chip for about 3 months now. I just upgraded to the k version so I can start overclocking so I don’t need this one anymore. Please feel free to message me with any questions. Ships to USA only! Important note, the stock cooler is included however I would NOT recommend using it. There is nothing wrong with it, but the cooler included will not suffice if you’re looking to do some serious gaming. 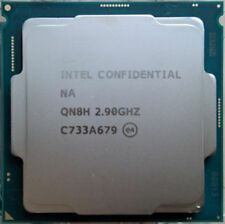 Intel Core i7-8700 - 3.2 GHz Hexa-Core (BX80684I78700) Processor. Condition is New. Shipped with FedEx Ground or FedEx Home Delivery. Socket LGA 1151 (300 Series). Unlocked Processor. Cooling device not included - Processor Only. i 7-8700K PROCESSOR. PROCESSOR: UNLOCKED. Up to 4.6 GHz max processor frequency. Max Processor Frequency: Up to 4.7 GHz. GTX 1080 8GB - The Best Choice For Gaming. SSD : Silicon Power Slim S60 512GB SATA 3 SSD. A Monstrous Looking Case With Full RGB. 16GB High Performance High Speed DDR4 Gaming RAM. This is a DUAL BOOT Windows 10 system. Socket: LGA 1151. Core Count: 6. Product Info. PRODUCT INFO. Product Condition: New. Instruction Set 64-bit. Instruction Set Extensions SSE4.1/4.2, AVX2. Product pictures may not reflect the most recent product revision. We do not accept re-sale certificates . NC, NJ, NY, PA, TX, VA, and WA. CA, CO, DC, CT, FL, GA, ID, IL, IN, MA. 10AM - All orders after cut off will be. Order processing cut off. Total Cache. Base Frequency (GHz). 16GB Included. Cores/ Threads. Mfr Part #: CM8068403358316. Processor Socket: Socket H4 LGA-1151. Processor Core: Hexa-core (6 Core). Depth: 1.5". Width: 1.5". Physical Characteristics. Thermal Design Power: 65 W.
Processor Core: Hexa-core (6 Core). Product Type: Processor. Processor Socket Socket: LGA-1151. Processor Generation: 8th Gen. Manufacturer Part Number: BX80684I78700. Product Model: BX80684I78700. Everyday computer tasks can happen faster with . Edit photos and videos seamlessly. Move between programs and windows quickly. Multi-task easily. Better still, all that performance comes with up to 10 hours of battery life, so you can take your computer wherever you go without worrying about cords and plug points. Mfr Part Number: BX80684I78700. Core Count: 6. Instruction Set 64-bit. Only Compatible with New LGA1151 (300 series) motherboard. Mfr Part Number: BX80684I78700. Core Count: 6. Socket: LGA 1151 (300 series). Lithography: 14 nm. DMI3: 8.0 GT/s. Model BX80684I78700. LGA 1151 Socket. CPU Socket Type LGA 1151 (300 Series). Series Core i7 8th Gen. 4.6 GHz Maximum Turbo Frequency. Desktop PC performance is redefined with up to six cores for more processing power. P/N: BX80684I78700. SKU: BX80684I78700. MPN: BX80684I78700. Core i7 Hexa-core i7-8700 3.2GHz Desktop Processor HD Graphics 8th Gen. Product Line: Core i7. 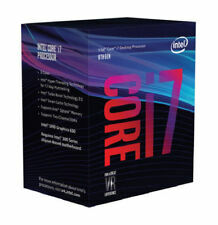 Product Family: Core i7. Processor Core: Hexa-core (6 Core). 2.9GHz ES processor. We will do our best and help you provide the solution. ETA 2 to 10 Weeks. 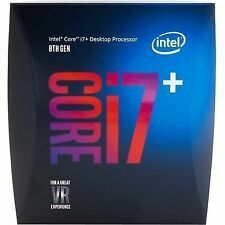 (Core I7-8700 8th Gen Processor. Guam, Puerto Rico, Virgin Islands, etc.). Desktop PC performance is redefined with up to six cores for more processing power. Scalable Portfolio of Processors. If form factor is your priority, the 8th Gen is designed for desktop PCs from high-performance gaming towers, to slick and stylish all-in-ones, to compact living room minis. Cache: 12 MB. Processor Base Frequency: 3.20 GHz. Processor Number: i7-8700. Number of Threads: 12. Lithography: 14 nm. TJUNCTION: 100. Advanced Technologies. Low Halogen Options Available: See MDDS. Gently used, fully tested and 100% working. No Overclock or other modifications done. Processor only (No Box included). Manufacturer Part: BX80684I78700. Core i7-8700 8th Gen Processor. Core i7 8th Gen. Up to 4.60 GHz. Coffee Lake. Max Turbo Frequency. LGA 1151 (300 Series). Graphics Base Frequency. Graphics Max Dynamic Frequency. Integrated Graphics. 3.20 GHz up to 4.60 GHz Max Turbo Frequency / 12 MB Cache. 6 Cores / 12 Threads. Socket: LGA 1151. Core Count: 6. Product Info. PRODUCT INFO. Instruction Set 64-bit. Instruction Set Extensions SSE4.1/4.2, AVX 2.0. Product pictures may not reflect the most recent product revision. Part Number: SR3QS. Compatible Part Numbers: SR3QS. General Information. Processor Type. Coffee Lake. Processor Architecture. Processor Data Width. 1 x Processor, 1 x Heatsink and fan. Graphics Base Frequency. Graphics Max Dynamic Frequency. Core i7-8700. 8th generation processor for impressive performance. 8th generation processor. Processor speed: 3.2 GHz (4.6 GHz with turboboost). - Supports three displays. Manufacturer's guarentee: 3 years. - Built-in security adds extra protection to your data. Core i7 8th Gen. CPU Socket Type. Graphics Base Frequency. Graphics Max Dynamic Frequency. Integrated Graphics. Virtualization Technology Support. # of Cores. Hyper-Threading Support. 8.0GT/s 12MB LGA 1151 CPU. 100% NEW GOOD CONDITION. If our product have any defective situation. 1 Year Warranty. Add to Favorite. Intel Core i7 8700 Six Core 12 thread LGA 1151 3.2 GHz CPU Desktop Processor. Condition is Brand New. Sent with Australia Post Pre-Paid Parcel Post Satchel 500g. 3.2GHz s1151. Coffee Lake. 8th Generation. NOTE: NEEDS MAINBOARD SPECIFICALLY FOR 8TH GEN - DOES NOT WORK ON 7TH GEN MAINBOARDS. Check out the full range of CPU's in our. We will always try to respond within 2 hours and are happy to provide any extra information you require. Sockets Supported LGA1151. Processor Base Frequency 3.2 GHz. Processor Turbo Speed 4.6 GHz. Cooler Included. Number of Core 6. If you have any problems, we are very glad to help you. Processor Socket - LGA 1151 (Socket H4). Processor Speed - 2. Processor Type - 80386. Processor Count - 6. Item Weight - 22.7 g.
Series: Core i7 8700. Processor type: Core i7. Processor speed: 3.2 GHz. Processor support: LGA 1151. color: Silver. Product details MPN: CM8068403358316. Prozessorsockel LGA 1151 (Buchse H4). Prozessor-Taktfrequenz 3,20 GHz. Prozessor Boost-Taktung 4,60 GHz. Anzahl Prozessorkerne 6. Maximaler integrierter Grafik-Adapterspeicher 64 GB.